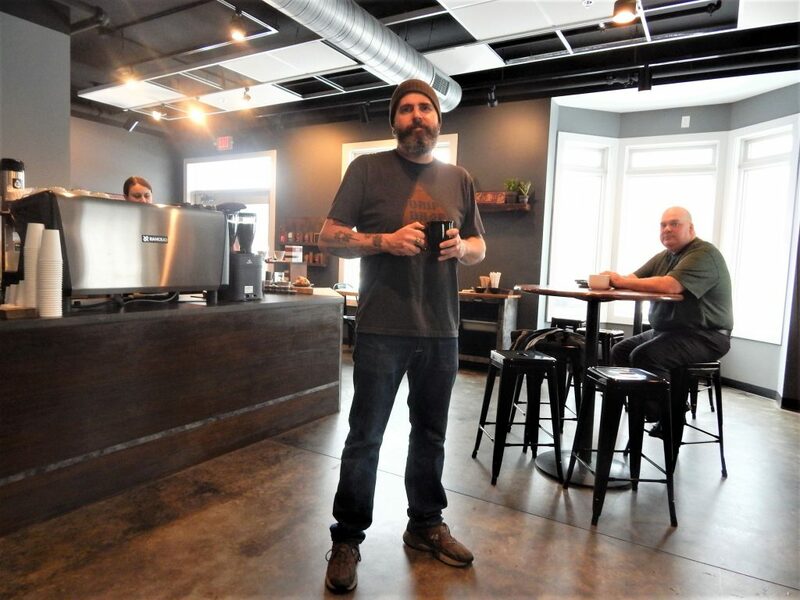 Drip Drop Drink owner Todd Johnson in the new cafe at 926 2nd Street in downtown Muskegon. 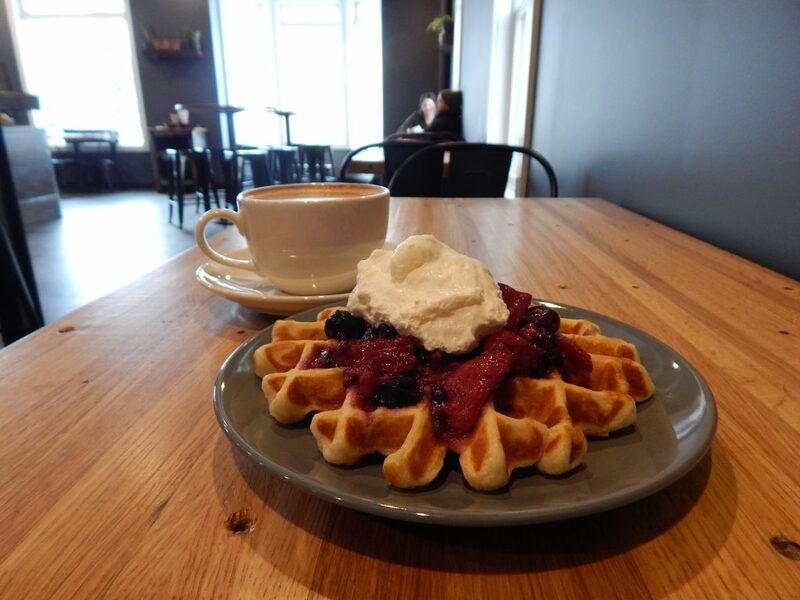 It’s 9 a.m. Saturday, and it seems like everyone in the new Drip Drop Drink Cafe has the same mission: waffles and coffee. “What should I get?” muses the woman in front of me. As I pause just before ordering, a man shouts the same sentiment. “Get the waffles!” he yells to me and makes a gesture towards the mountain of chocolate and cream before him. It’s effective marketing: I get the fruit compote and fresh cream waffles. The fruit compote and fresh cream waffles. The new venue, located at 926 2nd St., celebrated its soft opening last Saturday, Nov. 3, and, already, it’s a space from which community is born. When I stopped in this past Friday and Saturday, it was filled with nearly constant activity: people holding business meetings, writers hunkered down over laptops, a young couple who had just moved to Muskegon talking to the baristas about coffee, and friends planning a birthday party. It’s an intimate space that provides a well-caffeinated home to the eclectic group of people that enter its doors, from playwrights and teachers to real estate developers, construction workers, and retirees, among so many others. Which is exactly what Drip Drop Drink Cafe’s owner, Todd Johnson, wants: a business where all are welcome and from where creativity can flourish. The new cafe pours a variety of coffees, including Creation Coffee from Midland, Michigan. 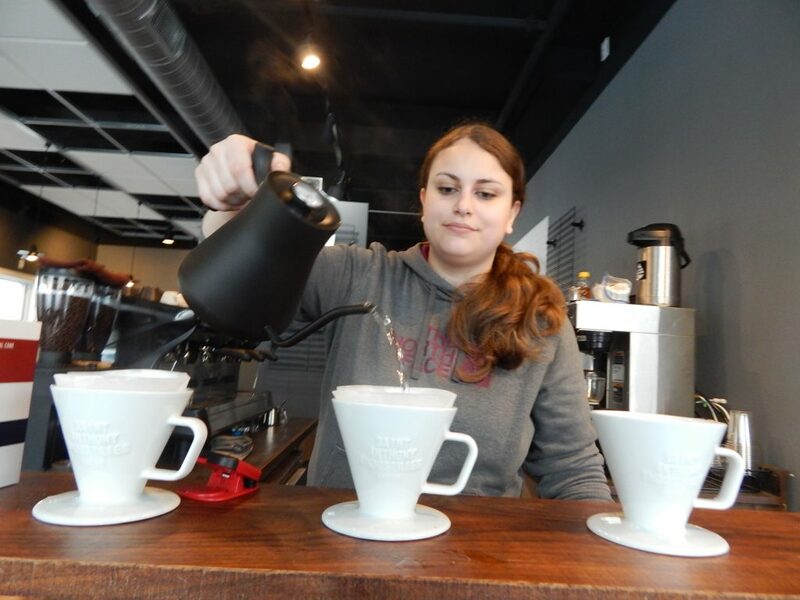 The cafe is the second Drip Drop Drink in downtown Muskegon; the original one is located about a block and a half away in the historic Russell Block building, where it shares space with Unruly Brewing and Rebel Pies. The first Drip Drop Drink opened in August 2013, and Johnson says he wanted to launch the second venue to accommodate customers’ oft-repeated requests for more space and an expanded menu. The owner plans to continue operating both Drip Drop Drink locations, and will “keep them different enough” that it makes sense to do so. At the new locale, there’s an expanded food menu that currently includes a variety of waffles, avocado toast, baked eggs, and yogurt bowls. Soon, they’ll offer homemade soups, salads and sandwiches. Almost everything is made in house. 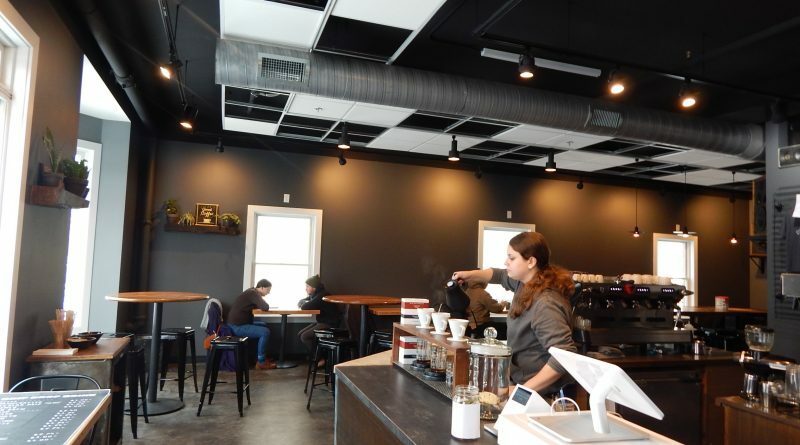 The coffee options too are different at the new space: the original Drip Drop Drink exclusively carries Counter Culture Coffee, and the new cafe has a variety of caffeinated offerings, including Creation Coffee out of Midland, Michigan. The menu mirrors the cafe’s interior well: there’s an industrial coffee shop vibe that manages to be both minimal and warm at the same time. It’s a land of wood tables and metal chairs in a room that’s flooded with natural light emanating from a giant bay window that looks out onto a growing downtown, from Baker College’s Culinary Institute of Michigan across the street to the Heritage Square condos and an ever-expanding Western Avenue. Story and photos by Anna Gustafson, the publisher and editor of Muskegon Times. Connect with Anna by emailing MuskegonTimes@gmail.com or on Facebook, Twitter and Instagram.